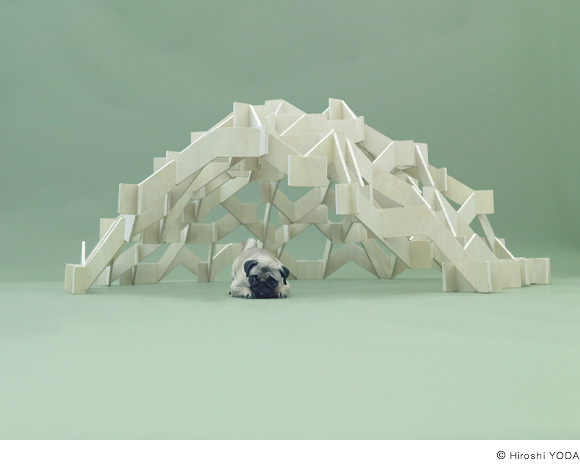 Mount Pug is a mesh-shaped “mountain,” assembly of thin and long 600mm (plywood) pieces as “branches.” By combining the unevenness of each branch to form in hexagon and triangle, the “branches” begin to support each other as if the cells of living creatures. The “mountain” can gain enough strength from it without nails or a bond. Pug is clever and mischievous. It makes full use of the mesh as its nest and plaything. Toys and snacks can also be hung on the mesh." Kengo Kuma was born in 1954. He completed his master’s degree at the University of Tokyo in 1979. From 1985 to 1986, he studied at Columbia University as Visiting Scholar. He taught at Keio University from 2001 to 2008, and was installed as Professor at the Graduate School of Architecture, University of Tokyo in 2009. 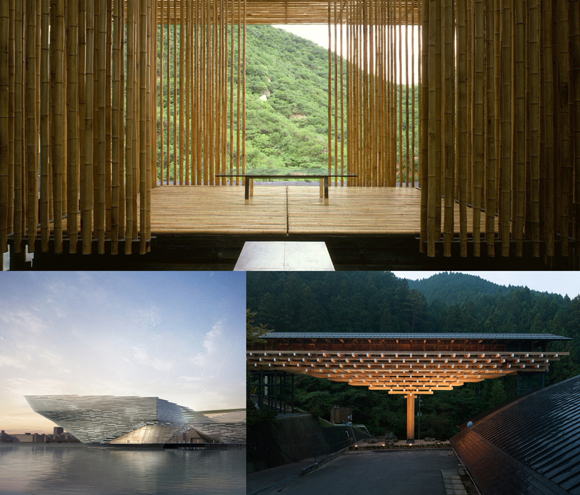 Among Kuma’s major works are Stage in Forest（1997,received Architectural Institute of Japan Annual Award,Water/Glass (1995, received AIA Benedictus Award), Bato-machi Hiroshige Museum (received the International Spirit of Nature Wood Architecture Award in 2002 Finland). A number of projects are going on in Japan and abroad, including Victoria & Albert Museum building in Dundee, (Scotland U.K) is in progress.